Facing an average nightly low of 21 degrees, most Boston-area farmers throw their hands up in January and take a break. But with recirculating farms — which can grow plants (hydroponics), fish (aquaculture), or a combination of both (aquaponics) — a farmer can continue generating revenue throughout the worst conditions that winter brings. Recirculating farms use continuously cleaned, recycled water in place of soil to grow food in a contained system. That, Cufone says, can allow the farms to operate without chemicals or antibiotics and be located right in the communities that will eat the food. Farmers can minimize transportation costs and fuel by serving a local market, making fresh healthy food, produced in an eco-friendly manner, more affordable. And, because the farm doesn’t connect to a watershed for either irrigation or run-off, the risk of releasing pollution or non-native species is virtually zero. The founders of Sky Vegetables see some potential for major market growth. The company looks for clients with unused rooftops, including in Boston, to build recirculating farms that operate all year long. “We’re looking to create a zero-carbon footprint in a closed-loop ecosystem that produces local, fresh, chemical-free food in the cities,” said Sky Vegetables CEO Robert Fireman. Until this year, the roughly three year-old company has focused on research, but their farm in Amherst, MA, already supplies fresh produce to restaurants around the city. This year, the company will build its first two rooftop farms for outside clients. The company is an ideal partner for supermarkets or restaurants looking to provide ultra-fresh, organic food to their customers. The Sky Vegetables system keeps crops warm in part by utilizing waste heat from the building’s HVAC system. “We’re trying to utilize all of the effects of the sun and all of the waste products associated with a standard building,” said Fireman. 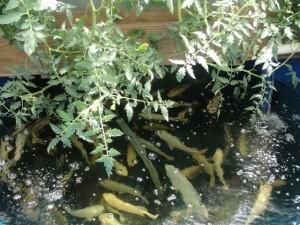 The farms use about a tenth of the water and a sixth of the nutrients as a conventional farm with a similar yield. The system does not use any herbicides, pesticides, or fertilizers. Operators enjoy immunity from crop failures caused by droughts, frost, floods, storms, and pests. But, he warns, it’s a lot of work. Building a recirculating system has raised the profile of Eric McClam and his father’s largely traditional soil-based farm in South Carolina. “It’s been a very good marketing thing, something people are very interested in and want to come and see,” said McClam. And marketing is key for City Roots, not only because the harvest is sold partially on-site, but also because McClam strives to build community in Columbia. He has hosted hundreds of volunteers and fun-seekers at their 3-acre urban farm, and the recirculating system helps attract the crowd. City Roots also hosts field trips for school children. McClam says the recirculating farm helps to teach biology lessons. The filtration of the water through the plants and fish is modeled on the biological cycles in a natural watershed. “It’s very educational and didactic to people that come and view it,” said McClam. 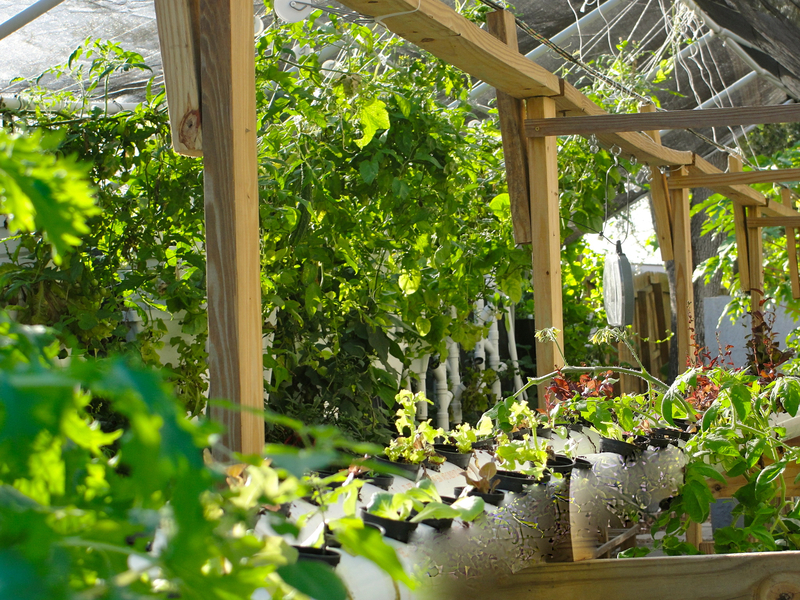 In suburban Orlando, Florida, farmer Sahib Punjabi has developed several models of miniature recirculating farms to fit in small, underused spaces, such as storage rooms and patios. In only 18 square feet, Punjabi’s “Zero Lot” Backyard Aquaponic System combines a variety of plant beds with a 55-gallon fish tank. He aims to build a totally self-sufficient system that can be deployed anywhere, from developing-world villages to U.S. neighborhoods. “This was a far superior way to grow it locally, grow it naturally, without having to resort to harmful pesticides and fertilizers and such, because if I did, my fish would die,” said Punjabi. Goldfish require less oxygen than many food fish, but still supply enough fertilizer to nourish lettuces, herbs, and vegetables. Punjabi uses a variety of bedding materials. “The whole idea is that the plants absorb nutrients from the water so that pure water goes back to the fish tanks,” said Punjabi. A single 50-watt pump circulates the water through pipes. Valves control the inflow into the beds. Punjabi emphasizes the importance of maintaining the water chemistry, especially the pH and the nitrogen cycle. The early adopters of recirculating farm technology are attracted to the systems for a variety of reasons — and have developed a wide variety of strategies. Cufone says she’d like the Coalition to act as a unified voice for these farmers, helping to represent them in policy debates, raise awareness and support for the farms and coordinate research. Because as varied as their operations are, the farmers are all searching for a better way to feed the world. 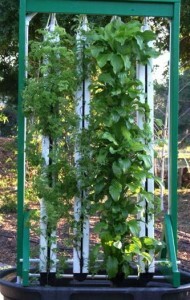 Recirculating farms offer a way to grow healthy, fresh, local food in an environmentally friendly way. “This is an alternative approach for growing that can help rebuild a healthy, sustainable food culture in the U.S.” Cufone said. 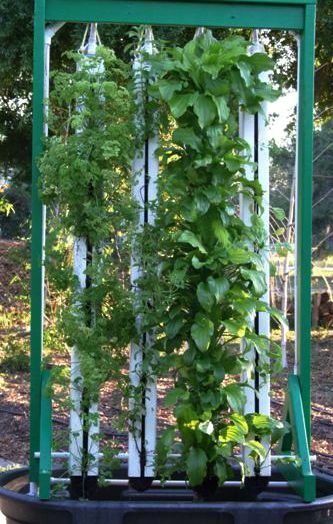 For more information on recirculating farms, please contact Marianne Cufone, Executive Director of the Recirculating Farms Coalition, at (813) 785-8386 or info@recirculatingfarms.org. Follow @recircfarms on Twitter, and “like” RecirculatingFarmsCoalition on Facebook. Sounds like a really cool idea. My grandpa would’ve loved to have something like this back in his day. Glad you enjoyed it! 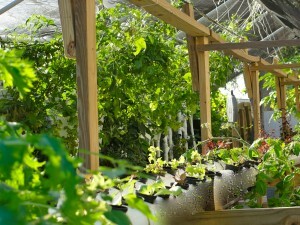 We’ll be featuring more aquaponic articles in the near future! Need of the hour when the food shortage is looming. We are new to farming and moving to a 38 acre parcel, agriculture, and are interested in aquapoinics? any thoughts wehre to start ? start up costs? water costs? this property has no pond or anything. Great! Hats off to Sahib Punjabi! I am from the Indian State of Kerala and request Sahib Punjabi to part with the know-how to go about building a miniature aquaponics system.